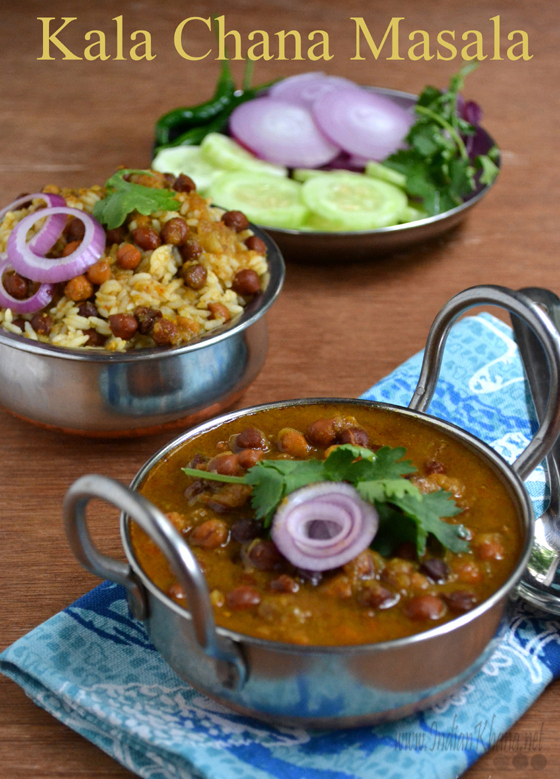 Who doesn't love chole or chana masala, though popular made of white chickpeas or kabuli chana another variety is to prepare from black chickpeas or kala chana. 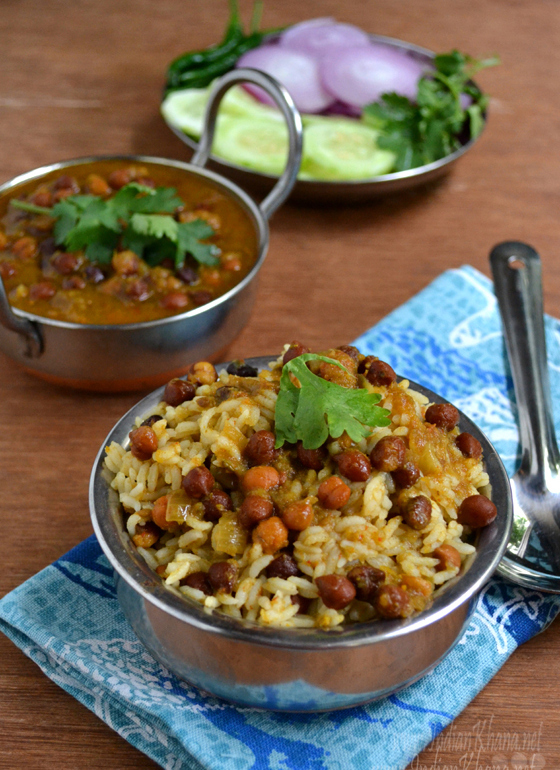 There are ample of variety to try with chana and I never get bored of it. 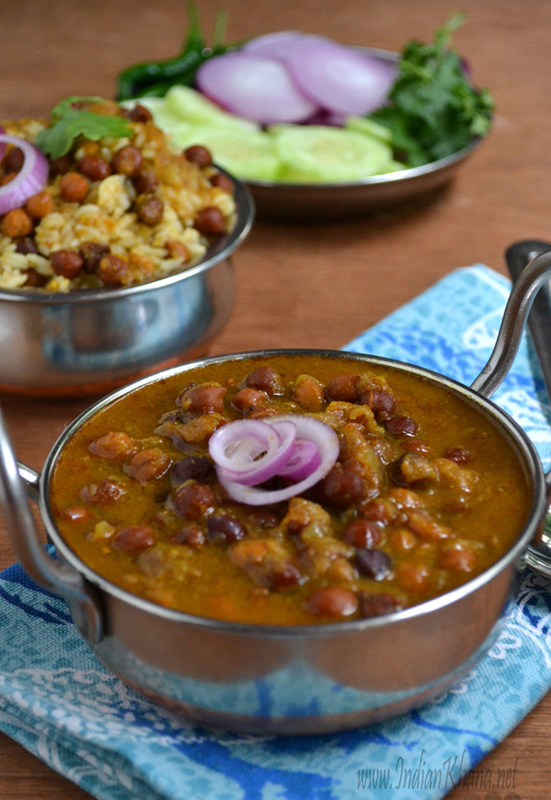 Best thing about chana masala is it goes well with roti/paratha or steamed rice. 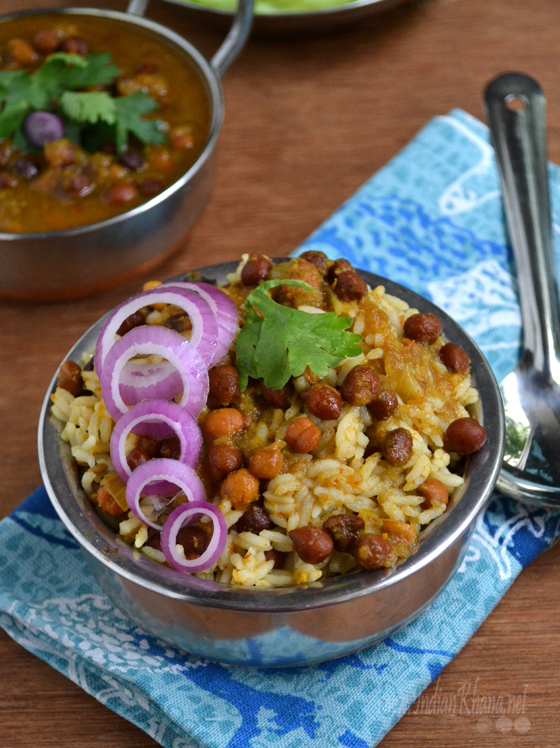 Punjabi's love their chole chawal or rajma chawal it's one of the best comfort food. If you go to Delhi or Punjab the staple food everywhere you can see is rajma chalwa, chole chawal, chole batura and boy people simply love this. Last weekend we were in Komlas for our breakfast I went with my usual rava masala dosa and DH with his favorite sambar masala and there was this couple I am pity sure from Delhi they has usual chole bataura. At my parents place black chickpeas is more popular than white one and this kala chana masala with poori is one popular combination you should try it's good. I normally end up making Chana Jor Garam it's perfect as a evening snack. Though personally I like white chickpeas chana masala over black more but for a change it's good to make this too specially with ajwain paratha it goes so well and makes it perfect lunch box recipe. Or just mixed it with steamed rice to have it as chole chawal and it's also works good as lunch box. Add whole spices with chickpeas before boiling it adds great flavor to chana you should really try that you will be amaze what difference it's brings to the dish but remember to discard the spices later. Most of the time I do this not only for chole but also for some dal. 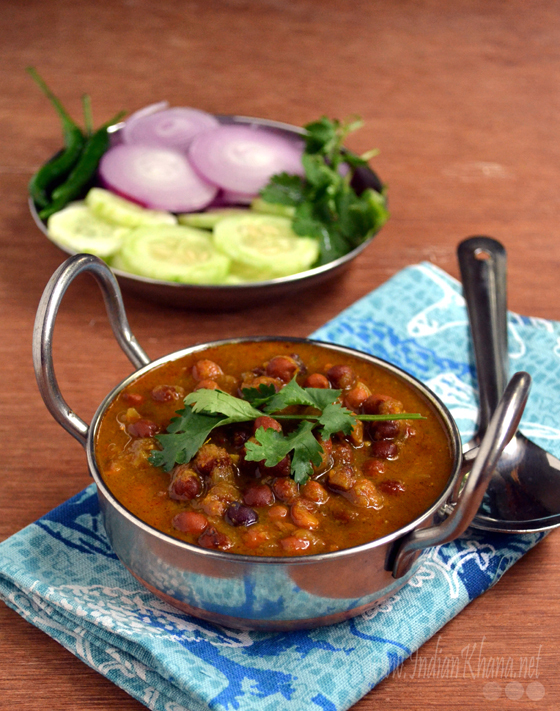 Normally this chana masala or chole taste better after few hours as all the spices gets blend together, so what I do? Simple make large quantity and eat during lunch and also for dinner it also give me little ease from cooking. Now let's just check out the recipe. 1. 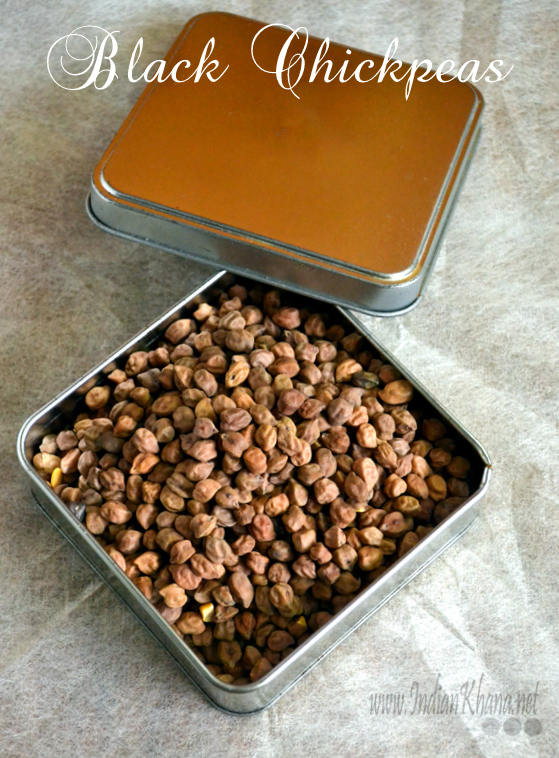 Wash and soak kala channa over night, next day rinse 3-4 times in water and pressure cook with little salt, bay leaf, cinnamon, cardamom ,clove and water for 3-4 whistles. Once pressure released discard whole gram masala. 2. Cut one onion in large chunks and another chop finely and chop tomatoes. 3. Heat 1/2 tbsp of oil a wok and saute onion chunks until light brown, allow to cool and grind with green chili, cumin seeds, fennel seeds with little water into fine paste. Puree tomato and keep aside. 4. In a same wok heat remaining oil, add hing and chopped onion, ginger-garlic paste and saute until golden brown. 5. Now add onion paste and saute until oil starts to separate. Add chilli, coriander seeds, turmeric powders and mix well, saute for a minute. 6. Add puree tomato and mix well, cook in medium to slow until oil separates. Add cooked chana along with water, salt and bring it to boil. 7. Add chole masala or garam masala, amchur powder and simmer for 10 minutes or until gravy thick. Garnish with cilantro and serve. As you can see we had it with rice along with some salad on side.